Assistant manager Tommy Miller hailed a “fantastic” win after FC Halifax Town scored in the 90th minute to secure a 1-0 victory at Southport. 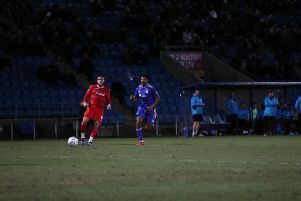 Shaquille McDonald came off the bench to seal the win and move The Shaymen out of the relegation zone. Miller, who took charge of the side in the absence of Jim Harvey, who was serving a one-game stadium ban, said: “It was fantastic. It couldn’t have gone any better, a goal in the last minute, a clean sheet - it’s a fantastic three points. “I thought the chance had gone when Peni (Richard Peniket) went through. “He said their lad had hold of his shirt so it could have been a penalty, but I thought that as probably it until Shaq (Shaquille McDonald) came up with that great finish. “There wasn’t much football being played. The state of the pitch wasn’t great, but we dug in, we battled, we put bodies on the line. “Just before we scored Bolts (James Bolton) has done a fantastic block. That’s a match-winning block, then we get the goal. Miller admitted picking the team was tricky, but praised McDonald’s impact off the bench after scoring as a substitute for the second successive game. He said: “We’ve got lads who are not even getting on the bench who could go into another team in this league and not look out of place at all. “It’s bee hard to pick the 16 and there’s been lads who have been disappointed not to start the game. “But we’ve told them there’’s games coming up thick and fast, they’re going to get a chance and they need to make sure they make the most of it when they get on the field, and that’s what happened today. “I’m pleased for Shaq, he’s chomping at the it to play. “It’s been frustrating for him, he’s not been getting the starts he wanted, that’s why came on loan, to play games. “But we’ve kept him involved, he did excellent at Gateshead, got his goal and he’s done excellent today when he’s come off the bench. Miller was delighted with the application from the Town side only three days after their grueling FA Trophy win at Gateshead. “We knew it was going to be a big ask today after Wednesday night,” he said. “There were a few lads tired, heavy legged, and we looked at the pitch and thought it looked heavy, but the lads’ fitness was fantastic. “They’re part-time but they keep going and that’s testament to them as a group. Miller, who has previously taken temporary charge of Swindon in his career, said Harvey was ecstatic to hear Halifax had won the game. “It was different,” Miller added. “Jim’s very vocal on the sidelines, although I am as well to an extent. “He’s delighted with the result. He was missed before the game, it was a bit quiet, a bit different and strange. “When (Paolo) Di Canio walked out (at Swindon) me and Darren Ward were players there then so we had a player-manager role, but that was difficult. “Today on the sidelines I enjoyed it.